20XX simply put, is Megaman X if it was a roguelike/lite. It plays and even looks like Megaman X, but in higher definition and add in a bunch of permadeath and random generation into the mix. Once in the game you'll be platforming and shooting / slicing baddies until you reach the end where you'll fight a boss in an arena style setting, much like Megaman games. You can also collect various upgrades and weapons while traversing the RNG levels. These upgrades vary from passive effects, such as increase HP or attack power, to active effects such as a new primary weapon, or special ability. You'll also be able to dash, super jump, and you'll be utilizing the best of your platforming and side scrolling action skills. The gameplay stay true to the Megaman formula but since it throws in a bunch of roguelike elements, such as RNG levels and enemy placement, it does suffer from level design when compared to the game's inspiration. Megaman games have always been known for challenging but memorable levels. With 20XX's dependence on randomly generated levels, it doesn't have the same impact in level design as original Megaman games. To contrast this critique, what the game gives up in hand designed levels, it makes up in replayablity, and variety. The game also offers 2 characters to play as. Nina, and Ace. I feel the game needs to take a look into the balance of the 2 characters, as Ace is by far much easier to use and often I do much better with him as a result. The art and sound design are great. It emulates Megaman X games well, except brought into the modern age of 1080 and 60FPS. I don't have much complaints about it's presentation. Every thing about how the game look and sound does a great job of paying tribute to it's inspiration. 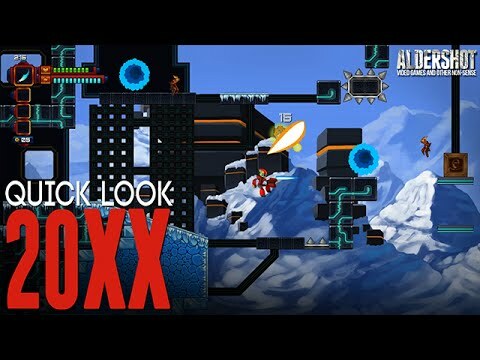 Overall 20XX is a very enjoyable roguelike/lite and the idea of mixing Megaman mechanics into the genre paid off. I feel the 2 genres are a great mix that seem so obvious once you play it! - Plays and feels great!